Home backgrounds boxes diy free printables Hats Images Justice League labels Masks party decoration party invitations Superman table decoration Superman: DIYs, Free Printables, Party Decoration Ideas and More. Superman: DIYs, Free Printables, Party Decoration Ideas and More. Great Superman Free Stuff for Parties! Superman Free Printable Candy Bar Labels. 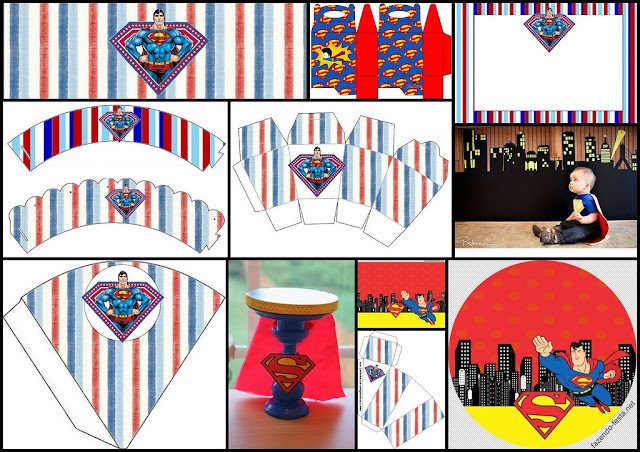 Superman Free Party Printables, Backgrounds and Images. DIY City Skyline for Super Heroes Party. DIY Super Heroes Cupcakes Stand. Superman: Princess Carriage Shaped Free Printable Box. Superman Free Printable Lunch Box. Superman: Free Printable Chocolate Wrapper. There are also great Free Printables, DIYs, Decoration Ideas and more in the Superheroes section that you also can use for your Superman Party, so, check them out!